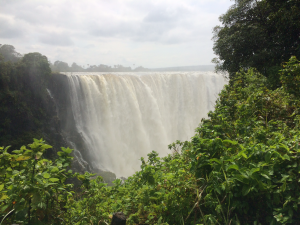 Today we visited Victoria Falls, one of the natural wonders of the world. 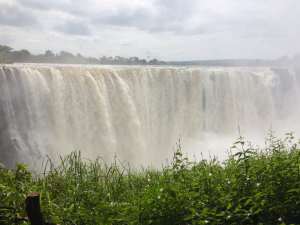 You cannot come to this part of Africa and not visit the Falls, or so says everyone I know who has been here. I’m not sure everyone is quite aware of the effort and cost one must go through for this visit. I’m pretty sure if you’re on a tour, most of the hassle and all of the cost will be hidden from you. 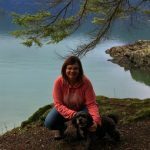 Here’s an account of the visit from an independent traveler. First you must decide which side of the falls you will visit, because they are in different countries. Most people visit in Zimbabwe, as we did. 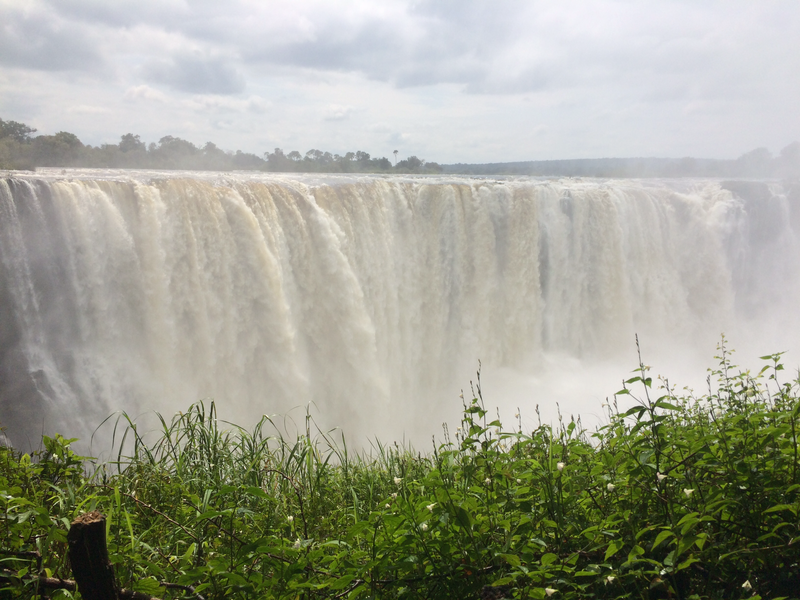 You can’t actually see the falls from Zambia, but with enough cash you can swim at the top of them. 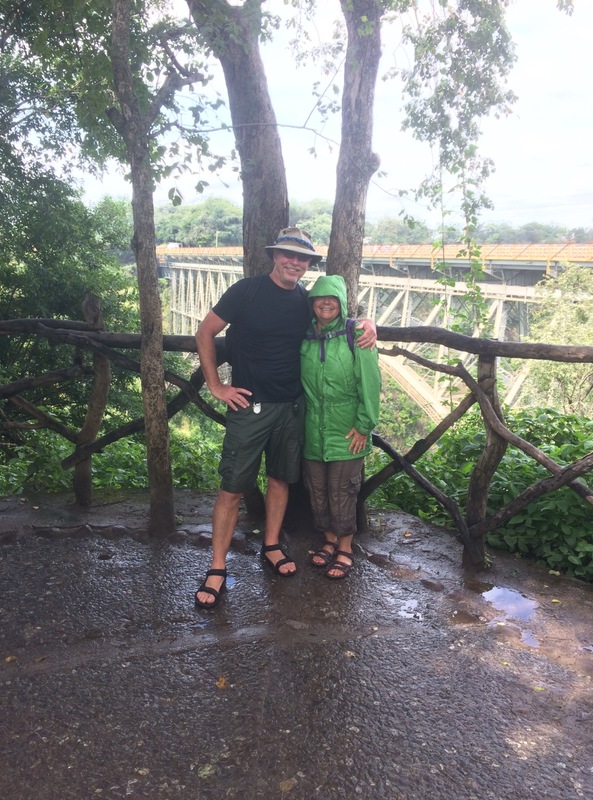 We got advice along the road that the best way to see Victoria Falls is to stay in the town of Kasane, in Botswana and hire a taxi to take you across the border. Zimbabwe has their own currency, but for some reason have decided that it’s worth exactly the same as the US dollar. Nice trick, Zimbabwe. As a result, everything is in US dollars. Canadians pay a higher Visa entry fee than most other countries – $75 US each. The Germans and Brits in line with us were all paying much less. Zimbabwe has a nice little gig going on, as the line-up to enter at the border is awfully busy. The Zambian border is right around the corner so the traffic and trucks clog the roads here and the border is mildly chaotic. The entrance fee to the park was another $30 US each and our taxi was 400 Pula (~$50 CDN) per person, and that after much shopping around in Kasane. All together, and with some fancy math and currency conversion, it was an expensive little excursion. It would have been even more if we’d decided to import Britzie. So far we have not pulled out a credit card on this trip, but today we were told the border and the park gate would take Visa. Oops – their machines were down. We really had to scrape together our 4 US dollars, all of our Botswana Pula and SA Rand. We emptied our wallets completely for the tip. Would have been a bad day for the pick pocket. After all of this we started to feel like we were entering a tourist trap, until we walked into the falls. Everyone is right. You simply cannot come to this part of the world and not see Victoria Falls, no matter the cost or how many hoops you need to jump through. The falls are truly magnificent. They are not the highest, the widest or even the largest in the world, but they are among the top 3 largest if you use water flow. 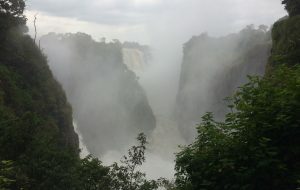 We are here at the height of the wet season, so at the falls most spectacular show. Being Zimbabwe, we are protected from falling over the cliffs and into the falls by a log fence that’s about as high as my knees. You begin exploring the falls at the north end. They rent out rain ponchos, but it doesn’t seem necessary at the start. We’d been warned and brought our own rain jackets, but Ray was too smart to put his on. 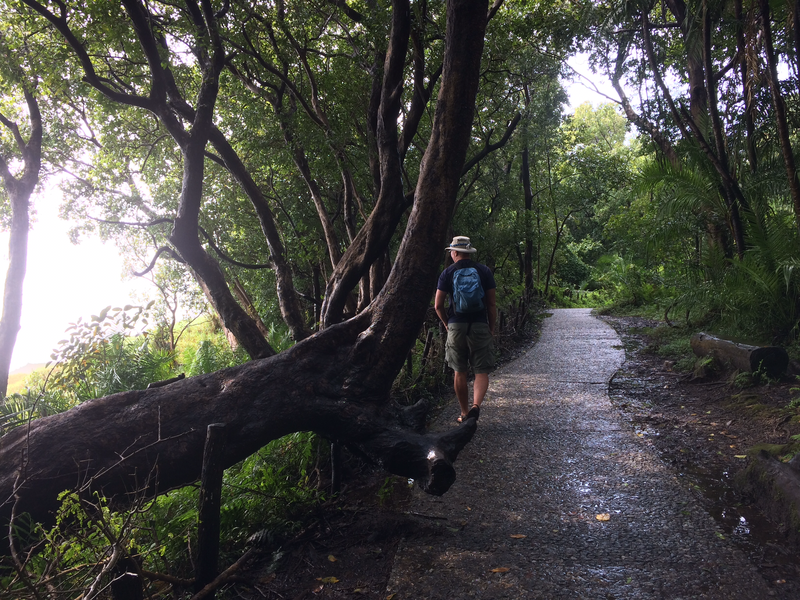 The jungle trail runs along the falls for a little over a kilometre, and as you walk you enter a dozen different viewpoints, each one closer than the last. The 11’th is labeled the danger route – so close you can barely see the falls, spray so thick you’d call it raining cats and dogs and no log bridge to stop you from slipping right over the edge. By the end, you can’t make out any of the falls, you’re just standing in its downpour. It was worth every penny. I found my African souvenir here. There’s very little chance I’ll actually get it because it’s large and would need to be shipped. I tried to make a deal with the carver but he didn’t understand. Our taxi driver took my email and said she’ll try and work something out. Not much chance, but we’ll see. Game drives in Chobe National Forest by land and water tomorrow.